The reversal of roles is an important concept in technical analysis: old support becomes resistance when it is breached and old resistance becomes support on a breakout. In the above chart, you can see the TSX Index struggling to break resistance at 12,200 which was support in the old trading range. Even if we get a breakout at 12,200 I will dust off my old charts detailing the old trading range of 12,500 to 12,200. The TSX had a dismal three year performance and the risk profile is still to the downside. 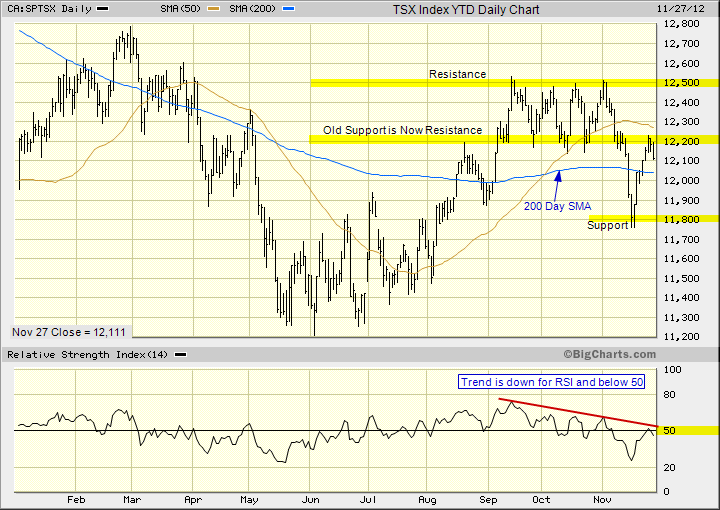 Reference the last chart analysis for the TSX Index published on November 9, 2012. Note: The above chart analysis is valid as of the publication date. To review current charts click on Home or perform a search. This technical analysis is for educational purposes so you can learn to trade online using candlestick charts. Please conduct your own chart analysis or consult your financial advisor before making investment decisions. The chart snippets are from BigCharts.com which I recommend and have used for fifteen years. The author of this article may hold long or short positions in the featured stock or index. This entry was posted in TSX Index and tagged chart analysis, resistance, trendline, TSX on November 27, 2012 by Trader.